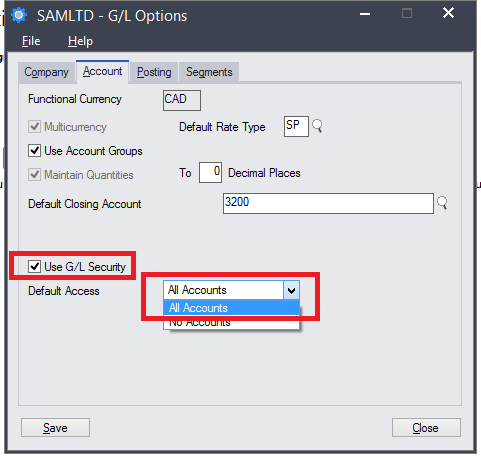 With the release of new Sage 300 version new Security feature implemented in GL Accounts setup. This security will allow to restrict the access of particular GL account to Sage 300 users. It helps to maintain the confidentiality of GL Accounts i.e. bank Account, Payroll account etc. and it will also minimize the risk of unauthorized activity. 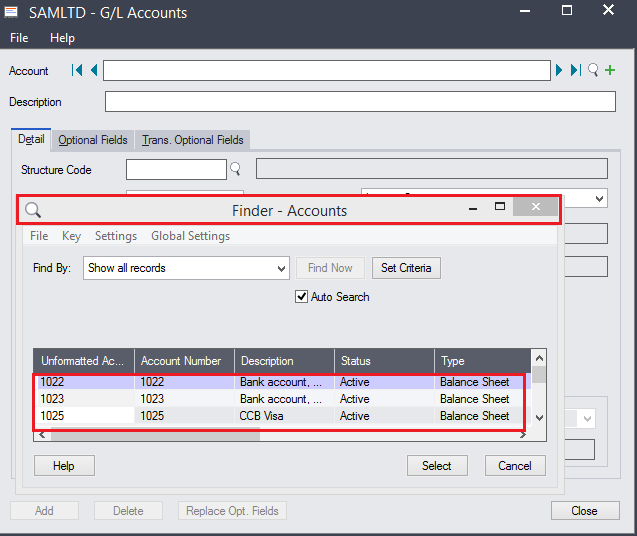 To Activate GL Account security first go to General Ledger à GL Setup –>Options. Select All Account from dropdown list. After saving this record user need to logout the sage 300 and Login again to activate the Account Permissions in GL Account. First we will look in to the GL Account before logged out sage 300 and after saving GL security mentioned in above screen. Here you can see there is no Account permission screen is present before logged out the sage 300 so to activate this security user need to re login the sage 300. After Re login the sage 300 user can check the new addition of security screen in GL Account. 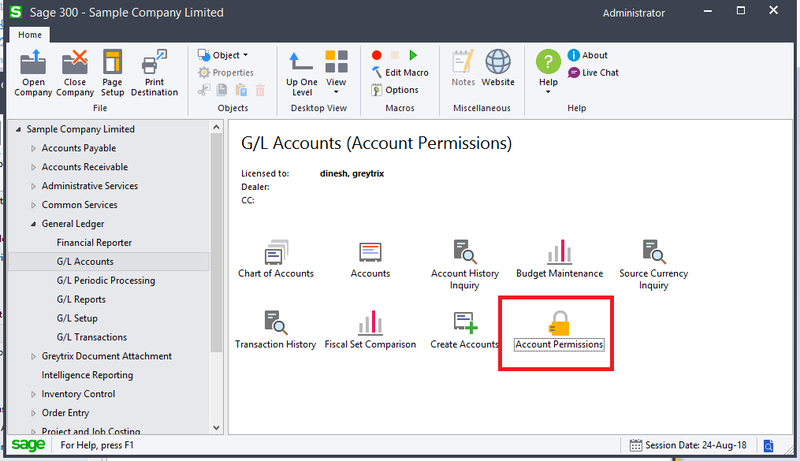 Open “Account Permissions” screen and enter or select the User ID to whom you want to restrict the particular GL accounts.The permissions per user can be set by segment or by account. 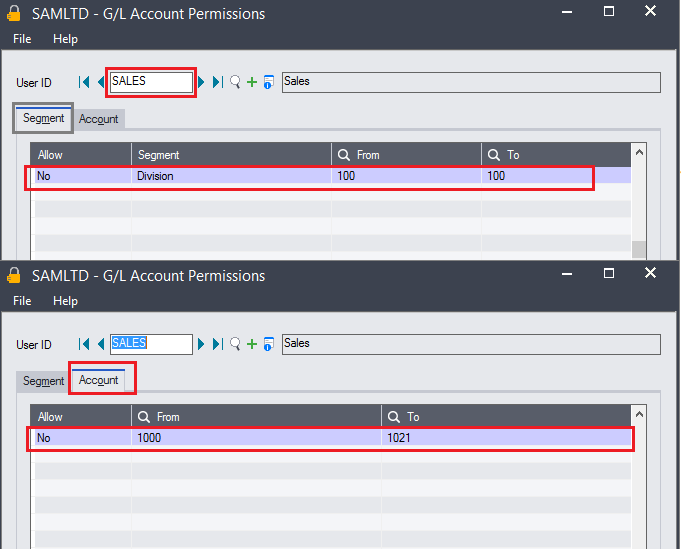 If the default in GL Options is set to ‘All Accounts’, enter accounts or segments that the user should not be allowed to access. 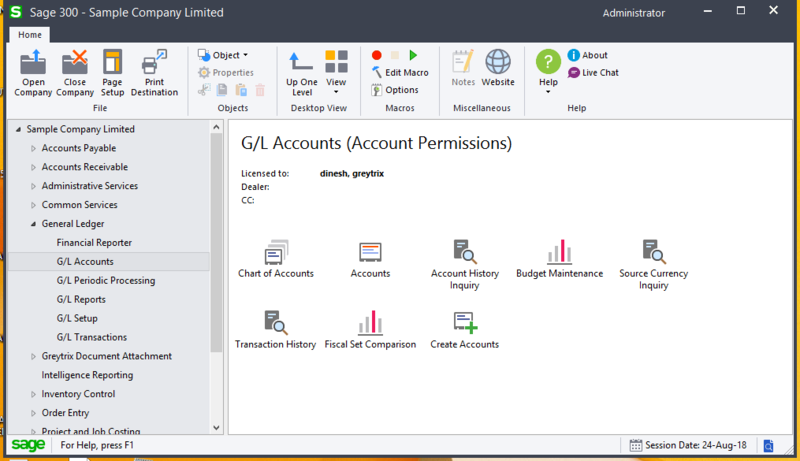 If the default is set to ‘No Accounts’, enter accounts or segments that the user should be allowed to access. Here we restricted Account number 1000-1021 for the user “Sales”. Once these new permissions have been saved, the user will not able to see the affected GL accounts at all in any screen, including finders. 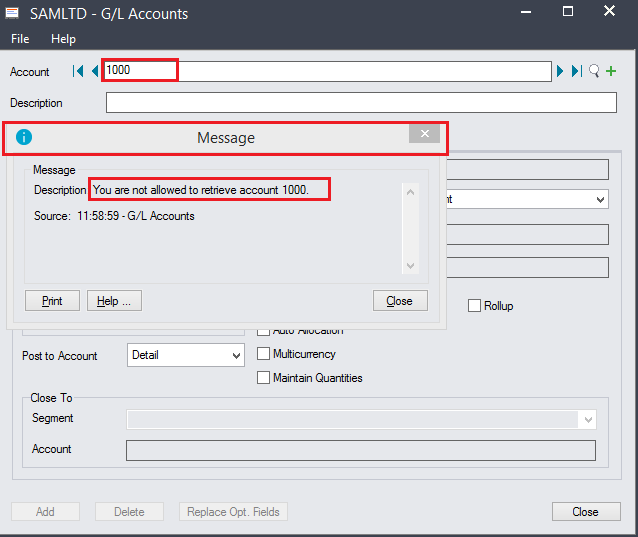 If they manually type in a GL account number that they do not have permissions for, an error message will be displayed as “You are not allowed to retrieve Account”. Login sage through restricted user i.e. here we are login sage 300 using “Sales” user and open any screen and select the restricted GL account. You can check below the GL Account 1000-1021 is not even list out in finder as well if user tries to enter it manually then system is showing restriction message. This is a powerful security feature to protect your General Ledger. Greytrix offers unique GUMU integrated solutions of Sage 300 with Sage CRM, Salesforce.com and Magento eCommerce along with Sage 300 Migration from Sage 50 US, Sage 50 CA, Sage PRO, QuickBooks, Sage Business Vision and Sage Business Works. We also offer best-in-class Sage 300 customization and development services and integration service for applications such as POS | WMS | Payroll | Shipping System | Business Intelligence | eCommerce for Sage 300 ERP and in Sage 300c development services we offer services such as upgrades of older codes and screens to new web screens, newer integrations using sdata and web services to Sage business partners, end users and Sage PSG worldwide. Greytrix offers over 20+ Sage 300 productivity enhancing utilities that we can help you with such as GreyMatrix, Document Attachment, Document Numbering, Auto-Bank Reconciliation, Purchase Approval System, Three way PO matching, Bill of Lading and VAT for Middle East. For more details on Sage 300 and 300c Services, please contact us at accpac@greytrix.com. We will be glad to assist you.